Today’s yay of the day deal are special markdowns on select jackets including this bell sleeve coat I reviewed here. 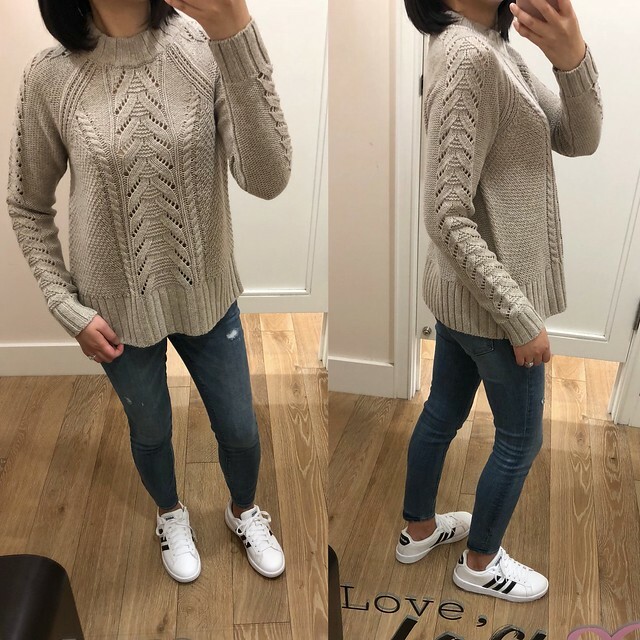 Today’s yay of the day deal are $20 sweaters including this cable shoulder sweater I reviewed here and this cute tipped sweater (also available in white). Since the daily deal requires no code online you can use code INSIDER371 for an extra $25 off full-price promotional orders of $100+. Alternatively, cardmembers can use code FESTIVE40 (the online shopping strategy I shared in this post) to save an extra 40% off. Both of these codes exclude full-price Lou & Grey. Note: You won’t see the extra 40% off reflected until you enter your credit card’s security code when reviewing your order and before you click on the ‘place order’ button. 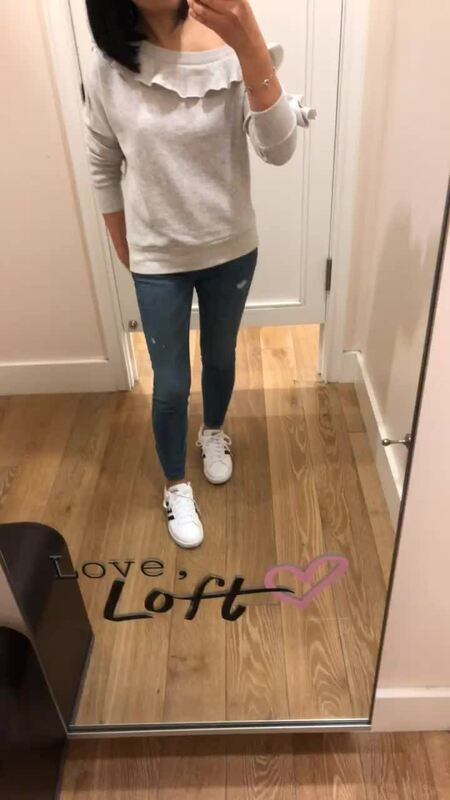 I found more hidden items from LOFT’s Black Friyay collection! The collection is available online if you search key words related to the top you’re looking for. e.g. ‘plaid‘ and ‘embroidered‘. Thanks to @jasmina.am for noticing and sharing this tip! I did a small giveaway for three pairs of these pink feather drop earrings in my Instagram stories last night. Congratulations @thepetitelawyer, @emalove @mellohello! Please message me with your details so that I can send you the earrings. 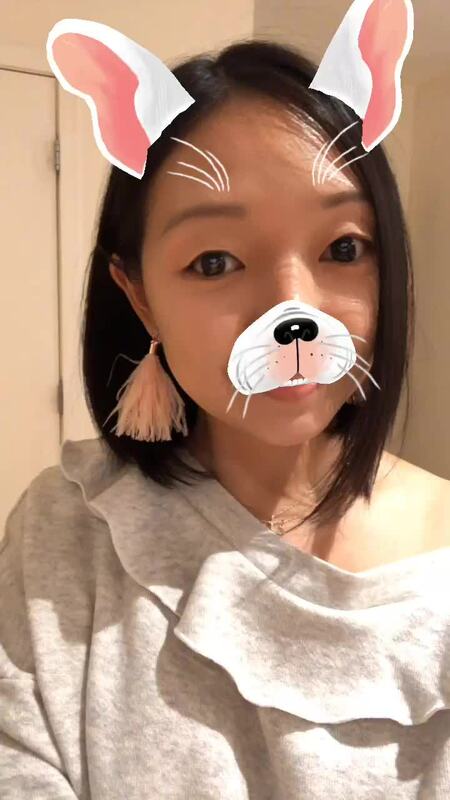 Below is what the earrings look like on me. They’re a lot bigger and fluffier than I thought. You may have noticed that they’re missing the round bead as seen in the online stock image. You can also see these earrings on the adorable @ellecentofanti. 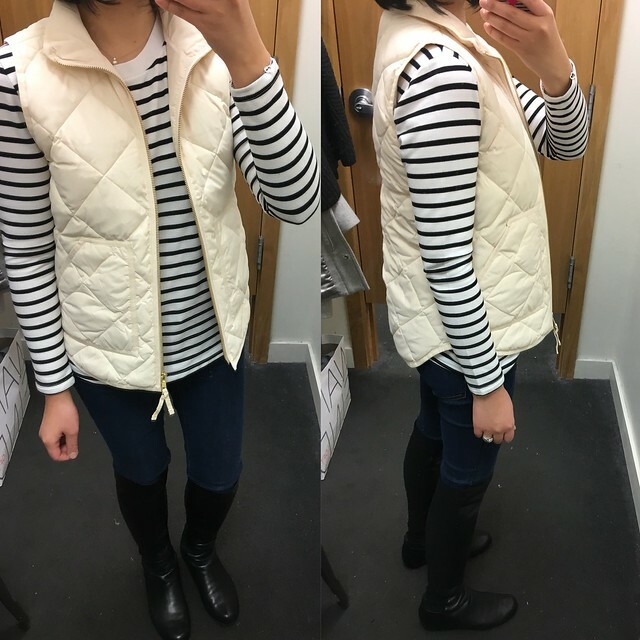 Below are some try-ons from yesterday’s shopping adventures. I love this ruffle off the shoulder sweatshirt and it’s also available in pink. If you like my distressed jeans there is a similar pair available now but with a chewed (frayed) hem which I reviewed here. 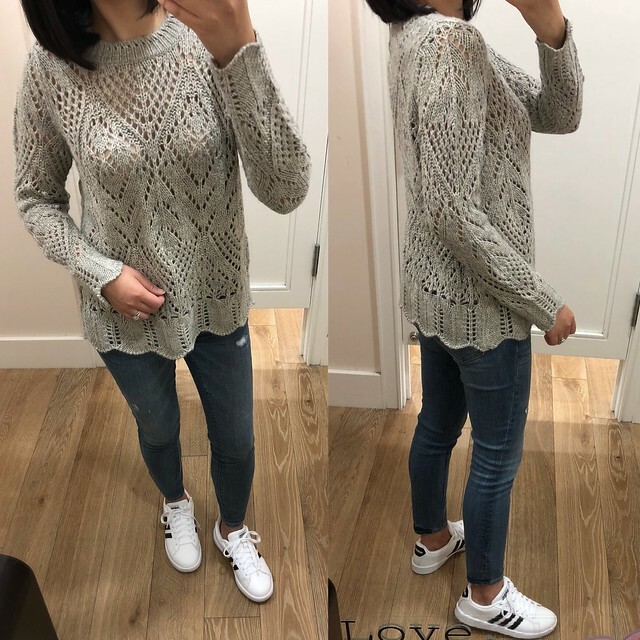 One of my followers asked me to try on this stitchy sweater since she couldn’t get to the store herself. 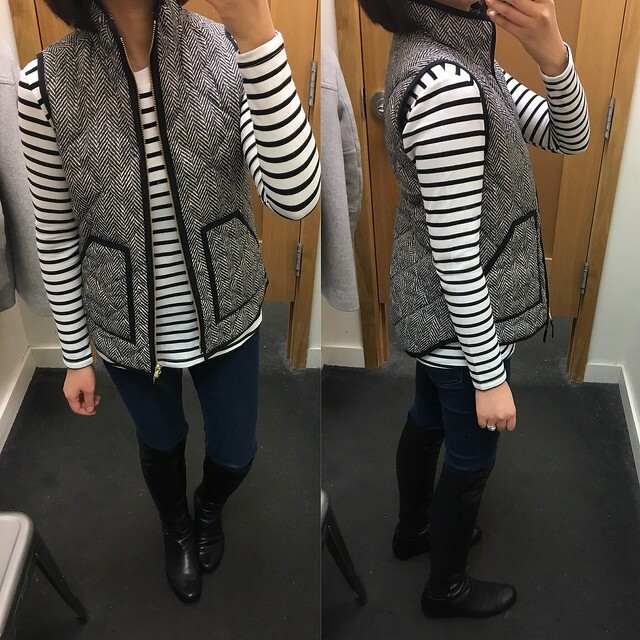 Size XS fit me well for a relaxed and flattering fit. I’d say this sweater runs true to size. The open knit detail in the middle does show your bra so a base layer is required. It contains 25% wool but it didn’t feel too itchy to me but I know many of you are weary of any sweaters containing wool. It’s also available in a gorgeous red that’s perfect for the holidays. 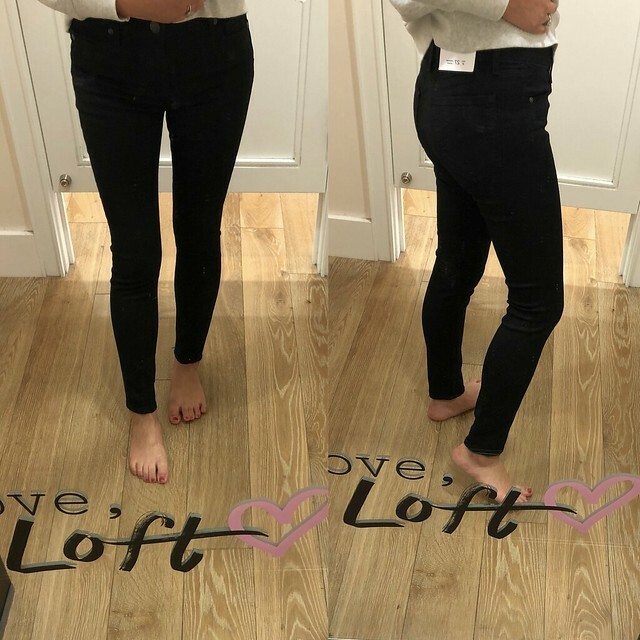 These black jeans fit just like the other performance leggings I reviewed here and here. 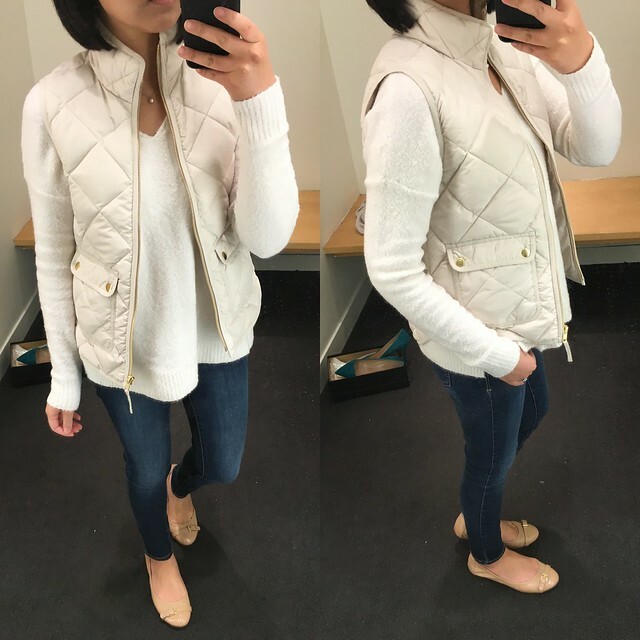 The fabric isn’t as soft and the sizing runs small so I would recommend going up two sizes. 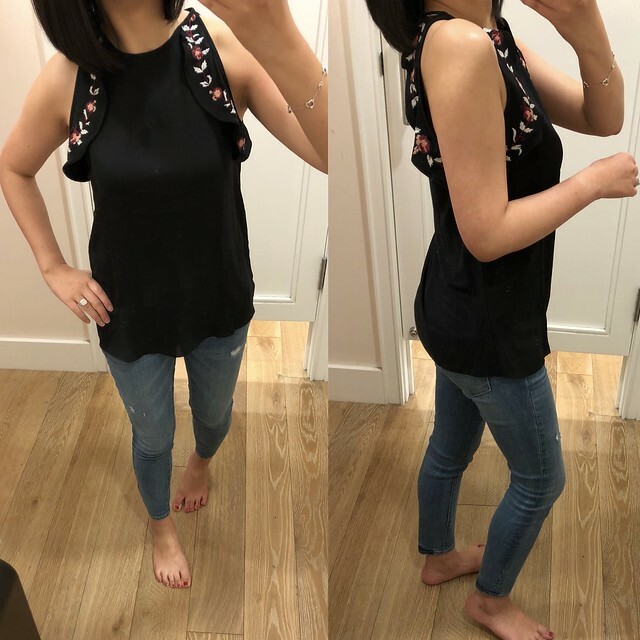 I am normally size 25/0P and fit size 27/4P in all three colors I tried on. As mentioned in this post I found that the inseam is inconsistent in all of the performance denim styles so you may want to order more than one to chose from. 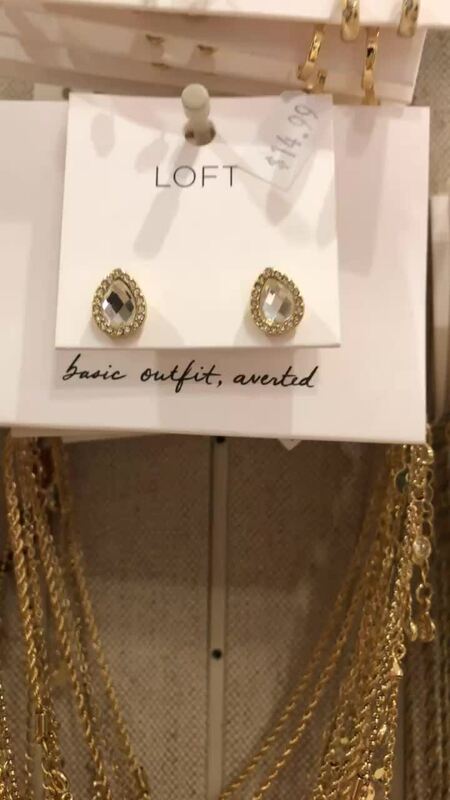 I received some questions about LOFT’s Black Friyay collection and found the collection at a second store I visited while walking around downtown Boston. This embroidered top is so adorable but note that the material in the back is 100% rayon. I recommend steaming the garment (top to bottom) after it is dry if you notice the length becoming shorter between washes. Steaming helps to soften and relax the fibers and stretch it back out to it’s original shape/length. Size XS fit me well so it may fit slightly smaller since I am usual size XXS and XSP at LOFT. Speaking of garment care I had a few sweaters (updated reviews here) where the sleeves became more snug after laundering. A few of you kindly shared some recommendations via direct message. I received a few confirmations for the tip that you can save your sweaters by rewashing and stretching them out hard with your hands before laying them flat to dry. I have yet to try this tip myself but I will have to report back. 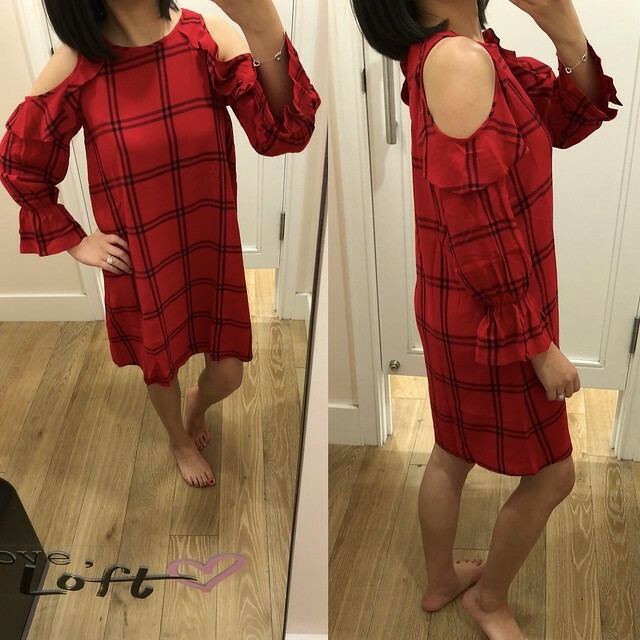 This red plaid dress is a pretty holiday option that I tried on in size XS regular. It has a very wide and swingy fit so I would recommend going down a size for the best fit. One of my followers asked me if the stones in these pave earrings were an exact match with the pave necklace. The center stones are different as you can see here. I love the pave stone necklace since it’s very versatile necklace that makes a statement despite the smaller size. Ann Taylor – Get 50% off everything + FREE shippping. Use code BESTMONDAY. Valid in stores and online. 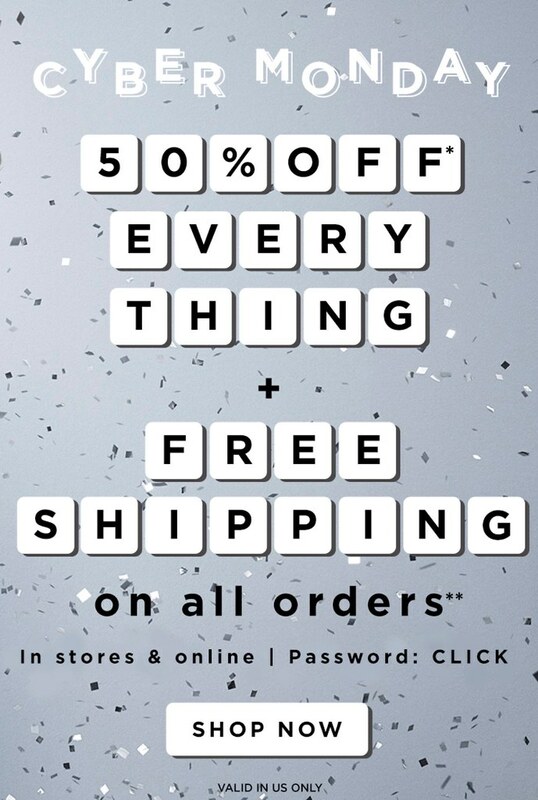 Banana Republic – Get 50% off everything + FREE shipping with code BRSHIP. Cardmembers get an extra 10% off with code BRCARD. My husband is a fan of the black t-shirts and the Camden fit style non-iron dress shirts. I ordered these pretty bracelets to try. After seeing the delicate one in stores a few weeks ago I couldn’t get them off my mind. J.Crew – Get 40% off + an extra 10% off select items through November 27, 2017, 11:59PM ET. 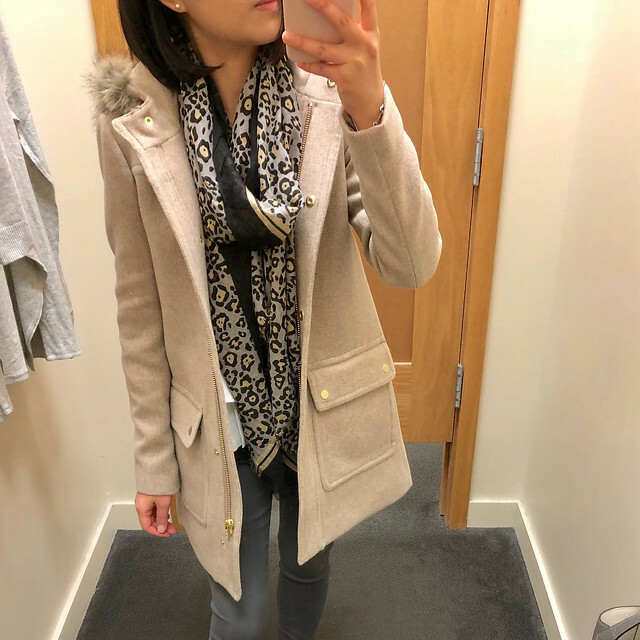 Valid online on full-price items marked “40% off full price with code SHOPFAST” and on sale items marked “Extra 40% off with code SHOPFAST.” Refer to my review of the Chateau Parka here. J.Crew Factory – Get 60% off everything (prices as marked, some exclusions apply) + an extra 50% off clearance. Also get free shipping with code CYBER. Valid online only. Refer to my review of the $134 Vail parka here. My favorite $19.50 plaid scarf is back again this season (minus the troublesome pom poms).